I was really excited when I was contacted about the opportunity to review this product. After having a browse around their website I thought that the SnoozeShade Plus looked really good, and it looked like something I would actually use. 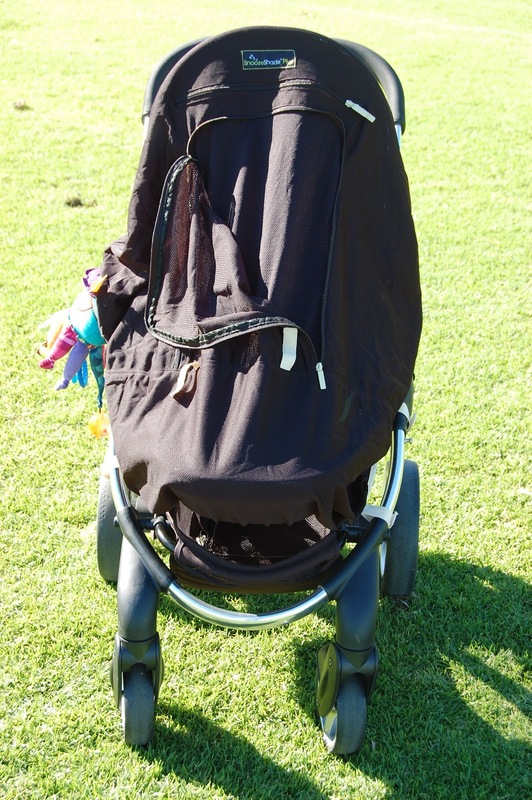 It is both a sun shade and block out sleep-aid cover for your pram or stroller. It takes the place of using a towel or blanket to cover the pram, of which older babies like mine will simply grab and pull off. This weekend we had the perfect opportunity to put it to the test. We were at a wedding (like I mentioned in my previous post) and Ezra's nap time was right in the middle of the proceedings. Before this point I hadn't even had a chance to pull it out of the packaging and have a good look at it, but it was so simple to use and attach to the pram, I just attached some velcro and it was ready to go. It is designed to fit any pram (stroller or buggy), I have an ICandy Peach pram, one that you don't see around too often, and it fits great. I gave Ezra a quick feed, plopped him back in the pram, covered him up with the SnoozeShade Plus, went for a short stroll (in the bright sun) and very quickly he snoozing away! Now time for me to sit down and enjoy a drink! One of my favourite features about the SnoozeShade Plus is the little zip opening, so that I can peek in on the little man to make sure he is asleep! The zipper is so nice and quiet that it didn't disturb him either. 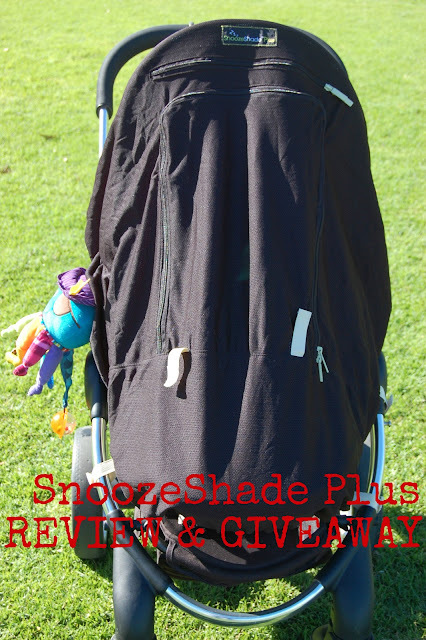 You can use the SnoozeShade Plus to block out light (94% of outside light is blocked, and UPF 50+) if you want your baby to nap, or it can be used just as a sun shade by unzipping the front panel, in this mode it shades their precious skin from UV rays (filters 80% of UV ) but lets them still look out at you and the world around them! The ease of use and the fact that it is lightweight earned big bonus points with me, it is easy to fold back into the little mesh bag that it comes in. This means that when I'm not using it, I can store it in the bottom of the pram or in the nappy bag, or the bag draw string has little velcro bits so you can hook it around the handle of your pram. With the Australian sun being so harsh, it is a good peace of mind to know that it keeps their bare skin covered and protected from harmful UV rays. This product has become one of my new go-to items, especially as a sun shade, Ezra doesn't nap in the pram as much as he used to, but I know it will be very useful for future bubs whenever they come along! He insisted on modelling the bag for me! The SnoozeShade Plus Retails for $49.95 AUD and you can buy them from this list of Retailers in Australia: HERE. They are also available globally so check out their website: HERE for international retailers and distribution. As a special deal for my Aussie readers if you use the discount code "YELLOWDANDY" to purchase online at www.snoozeshade.com.au you will get 20% off!! So one of you can have one too, YAY! 2. Leave a Comment at the Bottom of this post in the Comments section letting me know which one you have done. I will then use a computer randomiser to pick the lucky Winner. Winner Will Be Drawn on TUESDAY 17th JULY at 5pm (my time). This product was sent to me free of charge for the purpose of reviewing it, all opinions are my own and based on my experience with the product. 11 comments on "SnoozeShade Plus: Review and Giveaway"
I like you on Facebook! (and in real life too). What a fun giveaway! Jo! Your comment number was randomly selected!! Please email me your address to joelandkaren@gmail.com and I will get your new SnoozeShade out to you! Congrats! I already love ya in real life & liked you on Facebook ages ago ;) this would be perfect for Madi! Hi Kathleen, Yes it is open to outside of Aus too! I'm not sure that the Facebook like worked though.. you may have to try it again!